The embattled Mayor of Crystal City, already facing a recall election, was arrested Tuesday night during a city council meeting after the mayor and citizens got into a pushing and yelling match that got out of hand. Things got worse for the mayor when he was found with an illegal pill in his pocket when he was processed into the jail. Crystal City’s Police Chief, Jesus Lopez (no relation to Mayor Ricardo Lopez) said to reporters “He was inciting a riot” as the handcuffed mayor was walked from city hall. A half dozen television crews from San Antonio and Laredo recorded the entire incident. Mayor Lopez told reporters “Only in Crystal City, ladies and gentlemen,” as officers led him to a patrol car. The on-going level of lawlessness by city officials has been has been covered by Breitbart Texas on multiple occasions this year. The two major items of business at the Tuesday night meeting was the pending suspension of City Manager, James Jonas III, who was arrested along with Mayor Lopez and three members of City Council, on an assortment of federal corruption charges. The first vote by council secured that suspension. Then came the discussion on the details of the recall petition and the timing for the recall election for the council members. City Clerk Selina Ramos certified the petition to recall the Mayor and two council members, Rogelio Mata and Marco Rodriguez. Ramos then told the council that the five-day window for the mayor and council members to resign had passed, and they now faced a recall election. Mayor Lopez said that the five-day period only started yesterday, after the certification of the petition. With some in the crowd growing angry and taking the side of the city clerk, Lopez recessed the meeting to go home and gather documents, including a copy of the city charter to make his case. Lopez left the meeting, with a police vehicle following. When he returned, he started talking with some residents in the audience of about 100 people. The residents became angry and tempers flared. People began shouting and then pushing. Police stepped in, arrested the mayor, and drove him a little more than a block to the county jail. 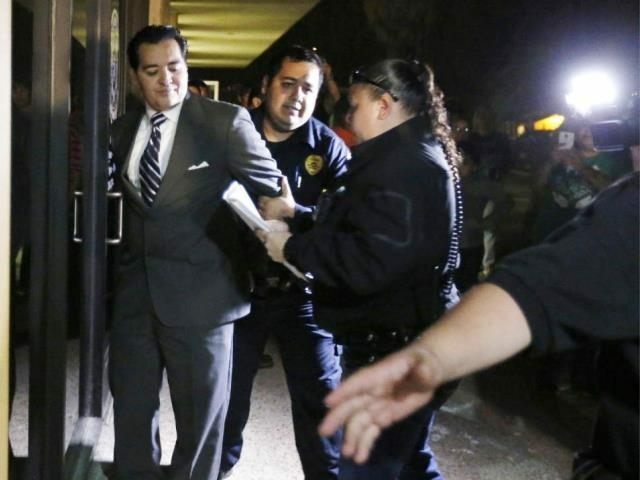 Dora Paloma, a former city judge, told the San Antonio Express News, “I think this whole town has gone crazy…this has never happened before.” As the mayor was led out to a patrol car to be taken to the Zavala County jail, some in the crowd cheered. City Councilman Joel Barajas said the city could go forward with the recall proceedings without the courts getting involved – but only if they acted when the meeting is scheduled to resume Wednesday night. Barajas is the only member of council not under federal indictment. Barajas then recessed the meeting for 24 hours. On Wednesday night, Barajas was the only council member at city hall, so the meeting was cancelled for the lack of a quorum.. “I’m just sorry it’s such a fiasco,” former mayor Frank Moreno told the Express-News. “It’s not good for our community. Crystal City Mayor Ricardo Lopez remained in the Zavala County jail until Wednesday morning, when things actually got worse for him. The police charged him with hindering proceedings by disorderly conduct & resisting arrest. When he was searched at the jail, there was a single pill of Vicodin, which is a controlled substance.It was not in the bottle pill bottle with his name on it, so that became a felony charge of possession of a prohibited controlled substance in a penal facility. After his release, the mayor told reporters “I will not step in another council meeting. Don’t care who the mayor is. Don’t care if I’m the mayor,” Lopez said. “I fear for my family. I fear that I will be incarcerated again for no reason.” Lopez didn’t answer the question about resigning as Mayor of this small Texas town. Rob Milford is a reporter for Breitbart Texas. You can follow him on Twitter@milford_rob.